Ich finde DIE SONGS gelungen. logisch justin bieber ist nicht mein ding. aber! was der leistet ist gigantisch. Dear god, make it stop, PLEASE! Bieber Fever is a terminal disease! nicht schlecht, aber der text handelt leider immer um das gleiche. Both albums are bad, and this is just both of them put together. Easy ratings! Die Songs sind teilweise gaz in Ordnung, wie er's rüberbringt aber bei weitem nicht. Crap at it's best. Peaked at number 146 on my personal 200 charts during 2010. Only a retard would chart something they supposedly hate so much. But then, you are retarded. Also, you're not smart enough to count to 146, so it's not like you actually have those charts. I find these albums a bit childish at times, but not overly horrible. If one song is already bad enough, an whole album? Sorry Ms. Bieber, but NO. 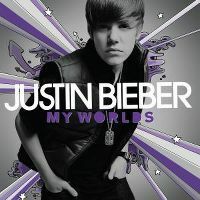 sometimes I wonder how many of justin biebers 1 star reviews are purely because hes justin bieber..
'My World' und 'My World 2.0' zusammengefasst als 'My Worlds' als kommerzieller Grosserfolg. Not hating but this really has to be one of the worst hyped up debut albums i've heard considering this guy sells in bucket loads. Obviously it is targeted to his teenage audience but one wonders how many actual people could actually make it through the whole album without turning it off. pretty okay for a debut, but there are some trash tracks. There are some good/decent songs on it but it's filtered out by some really terrible ones. Das geilste an der CD ist immer noch das Booklet. Haben uns köstlich über diese Frisur und seine Augenbrauen amüsiert. Belanglos bis schlecht. Voor meisjes met een nat slipje`=-,. . . . . . . . . .,%`>-- ☺!! !